7th Group Stage match of CLT20 2014 was played between Kolkata Knight Riders and Lahore Lions at Rajiv Gandhi International Stadium, Uppal, Hyderabad. 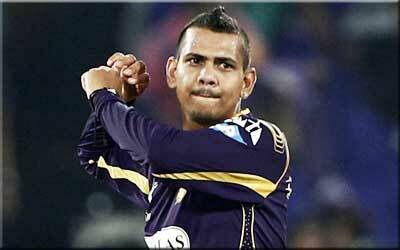 Kolkata with good all-round performances won the match by 4 wickets. Gautam Gambhir bated well and made 60 runs, but SP Narine's magic spell of 4 overs - 1 maiden, 9 runs and 3 wickets awarded him man of the match for superb bowling. Earlier, Kolkata won the toss and put Lahore into bat first. Lahore gor good start and put 50 runs for first wicket before Nasir Jamshed unfortunately got runs out of superb throw of Russell. Ahmed Shehzad played good inning and made quick 59 runs of 42 balls. Umar Akmal also contributed 40 runs of 24 balls. Other Lions batsmen could not understand Narine's magic balls and Lahore managed to put 151 runs at the end of 20 overs. Following target of 152 runs, Kolkata got very good start with RV Uthappa and skipper G Gambhir. Both played well added 100 runs for 1st wicket before Uthappa got out scoring 46 runs. G Gambhir also played anchoring inning and contributed 60 runs before he departed. rst was done by SA Yadav	and Kolkata won by 4 wickets with 3 balls remaining. SP Nariine declared man of the match for his magic spell of 4 overs - 1 maiden, 9 runs and 3 wickets.